embracing sustainability... one step at a time: The Khamba Effect! 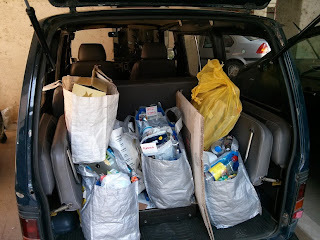 Last couple of weekends were our bi-monthly Recycling visits, and Compost Sieving Hence, I decided to document our journey to waste-less wonderland! 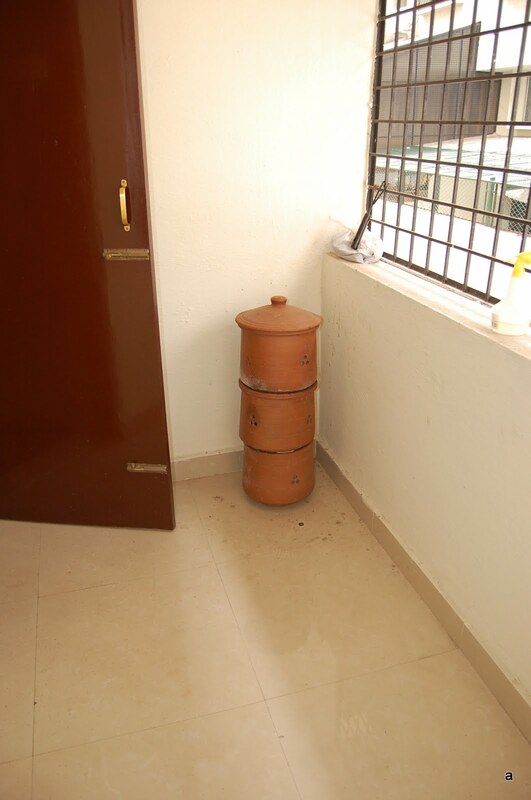 One of the first things we picked up when Ashwin and I started living together was a Daily Dump Khamba. Being first time cooks and managers of entire household, we felt it would be good if we started segregating at source, from the beginning. It was very easy, as we had no prior habits/practices. 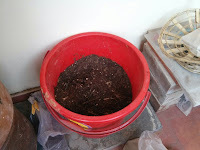 Mr. Composter, as we fondly called it, had a room of its own, and we had a tiny bin in the kitchen. We'd fill it up during the day, and once a day, feed Mr. Composter. It was that easy. 2. The (normal) monthly supply of 30 garbage bags lasted a YEAR! 3. 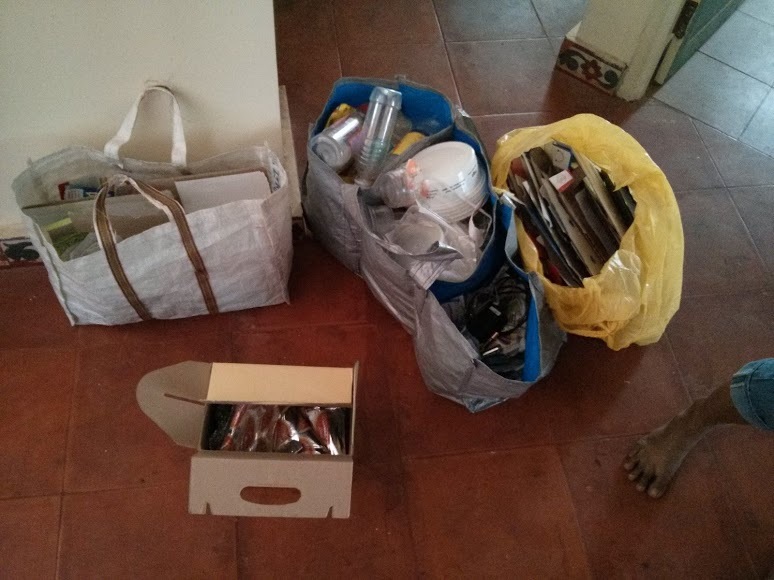 We realised (better late than never), about 80% of whatever was getting into the garbage bin could be easily recycled, because most of what we throw out, is basically packaging of food stuff, cleaning stuff, generally, stuff. 3. 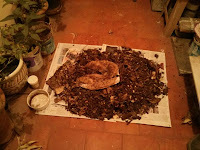 This was little scary at first, but one fine day, I opened Mr Composter to dump the day's waste, and Mr. Lizard popped out of it. I've always been borderline paranoid/disgusted with these creatures, so I was very upset seeing it. But then, realised, fruit flies had practically disappeared. So it was finally time to call it a truce. Now, I've made peace with it, and we fondly call it Mr. Friendly Composter Lizard! Presenting: 3 months of kitchen + garden waste! All kicked about composting, we did a little googling and found out about these people who were trying different ways to make their lives "Zero Waste". This idea fascinated us. We decided to try it out ourselves. So we started segregating. We initially had five segregation "bags"
1. 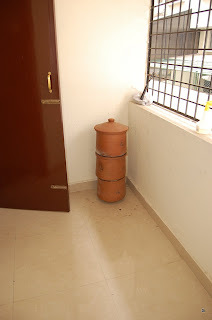 Newspapers: These are, by default, in any Indian Household, carefully stacked in a special storage, to give to the "Kabadi-wala" (or recycler) and we get a handsome sum in return. But then, with something you consume everyday, how much can you really keep upcycling? Some need to be recycled through large agencies. 3. All packaging - cereal, tea cartons, flipkart boxes, the plastic covers that on all flours etc. All food stuff, very simply, we would rinse the packs n hang them to dry on our window sill for couple of hours. So instead of dunking these into the garbage bin, they were dunked into our kitchen sink to be washed with all our utensils. 4. Plastic bottles - all our cola, soda bottles got into this bag. When we took our monthly wastes to the "kabadiwala", he rejected our tetrapaks and the glossy cartons like the tea cartons saying they re not recyclable. 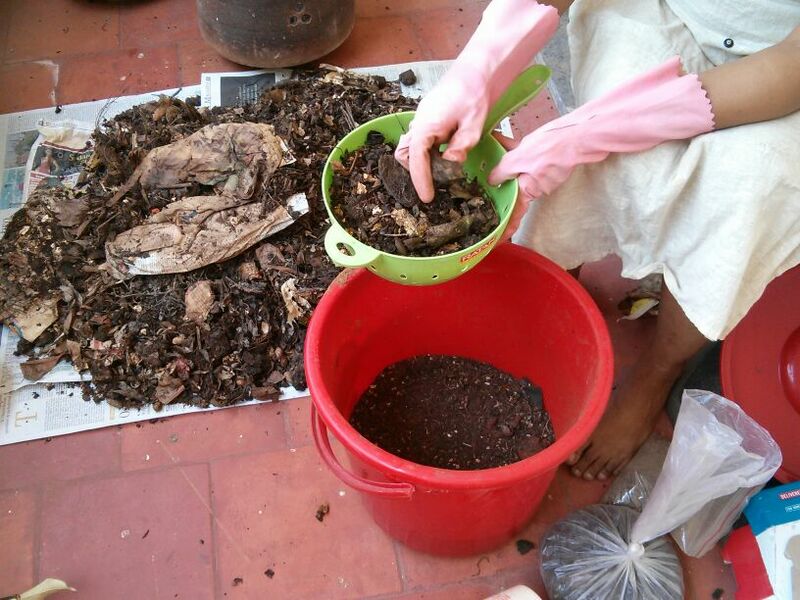 Some more googling and we came across Saahas, a waste management NGO, pretty close to home. This seems to be a decent model for us now. What more, we got our parents too to segregate, and my already segregating friend moved to our apartments. So we now sync our trips to Saahas and car + recycle pool. It is quite fun!